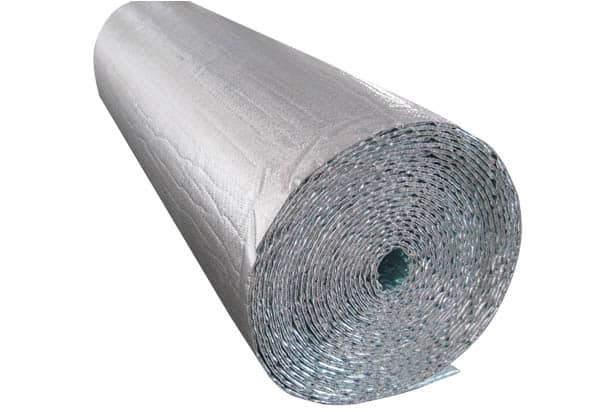 With rising energy costs, now is the time to install radiant barrier foil. Ask About Our Federal Tax Credits! Houston experiences one of the country’s widest temperature ranges. Temperatures vary from lows in the teens in the winter months to highs exceeding one hundred degrees in the summer months. Let’s face it – air conditioners and heaters are the only way to deal with Houston’s harsh climate. There’s only one catch: heaters and air conditioners consume energy – lots of it. In fact, up to 70% of your yearly energy consumption can be attributed to cooling and heating alone. Good news is, you don’t have to feel bad every time you touch that thermostat dial. There’s actually an easier way to lower your energy bills without spending thousands of dollars on energy efficient fixtures. There’s also no need to perform any crazy remodeling with your home. Radiant barrier foil has been around for a while, but it’s only until recently that contractors and homeowners recognized the true potential of this product. Cities around the country have actually added a mandate to their building code to include radiant barrier foil in all new home construction. That alone should prove its effectiveness. Read it for yourself. Section 402.7 of Austin Building Code (Page 7 if you want to skip the jargon) was amended to include Radiant Barrier Foil. Heat is transferred to your home by conduction, convection, and radiation. Conduction is the transfer of heat between two objects – like how butter melts in a hot pan, or when ice melts in your hand. The less dense a material is, the less conductive it becomes. Meanwhile, Convection is the transfer of heat through air. A good example is how a turbo broiler cooks food, or how hot air rises to the top of the room. Radiation is the movement of heat across space, irregardless of whether or not there’s anything in it’s way. It is responsible for majority of the heat transfer among homes. In fact, much of the heat in your home is radiated heat from the sun. Okay, it’s aluminum insulation, no big deal. Can’t regular insulation also do that? Conventional insulation only slows down the transfer of heat. Eventually, the heat will reach the attic and ultimately, your living space. 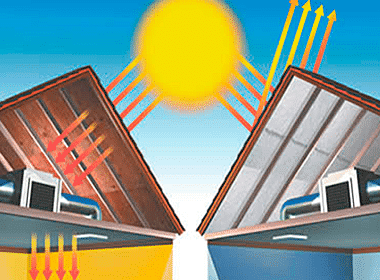 Radiant barriers prevent thermal transfer by reflecting 97% of the heat off of your roof at all times. Our American Made Radiant Barrier Foil is thicker than the competition AND we give a lifetime warranty on labor when we install it in your home! Because radiant barrier foil is not as dense as regular insulation, it does not conduct heat as effectively, leaving you with a cooler roof and a cooler living space. Your air conditioner does not have to work as hard when you already have a cooler home to begin with. This means lesser cooling and heating costs and it helps to prolong the lifespan of your AC unit. Keep the summers bearable with your own radiant barrier foil installation. The difference is noticeable fast, and the savings on your power bill will be just as awesome! 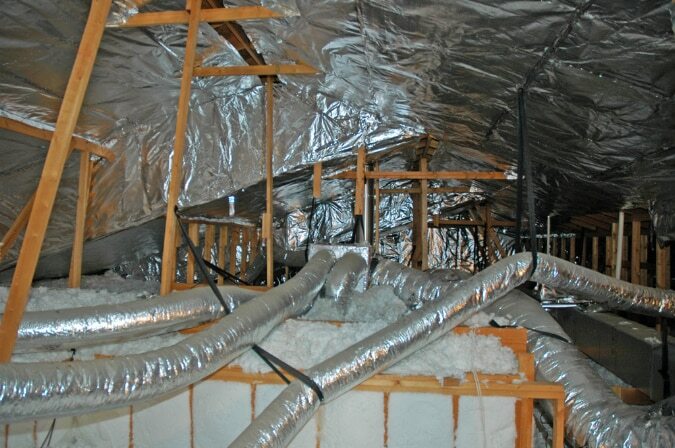 Having your attic properly insulated is a major step to conserving energy and lowering utility costs monthly. As good as radiant barrier is, it is only a tool in the multitude of tools that keep your home efficient. If you only had radiant barrier foil and nothing else, you probably wouldn’t see the benefits. So, if you have both radiant barrier and good attic insulation, then you are able to reap the benefits of a more energy efficient space. If, when you go up into your attic and you can see the floor joists and the insulation is settled, you probably need to refresh that old insulation to maximize the effectiveness in your attic. Ultimate Radiant Barrier & Insulation now proudly offers Radiant Barrier Foil, Blown-in Fiberglass an Spray Foam Insulation and other attic energy saving products. Contact us today and find out more about how to make your home more energy efficient. Our professional technicians will come to your home and evaluate your insulation needs. They will then go over with you every option and find the best solution for both your home and your budget. Call us today!